Test Stamps (also called Dummy Stamps in the U.S.) are created by stamp printers and post offices to test printing and production processes and other machines. While a few have had extensive philatelic distribution, most were never intended to be known to collectors and are very scarce. New discoveries continue to be made. All items are available for viewing on approval. I have a constantly changing stock of Norwegian and all Scandinavian essays, proofs, reprints, specimens, and test stamps. Most such items sell before they get to the website or price lists. What are you seeking? 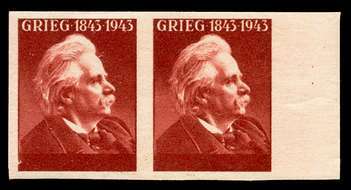 The 1943 Edvard Grieg stamp design, in the Brownish Red of the 20 øre value, was used as a test stamp in 1951 by a British printing press manufacturer that was hoping to sell a press to the Norwegians. The test stamp does not have the country name or denomination. Though sometimes seen in auctions (that should know better) offered as a "proof", this is a test stamp of relatively modest value. Usually seen imperforate, however perforated examples do exist but are quite scarce. Grieg 1943 Design Test Stamp printed in 1951. Right-margin Imperforate Pair, NH VF. Has the usual gum wrinkle out in the right sheet margin, but the stamps are VF without any wrinkles -- unusual thus. 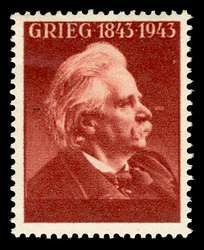 Grieg 1943 Design Test Stamp printed in 1951. Imperforate Pair, NH VF, but right stamp (only) with a typical crease. 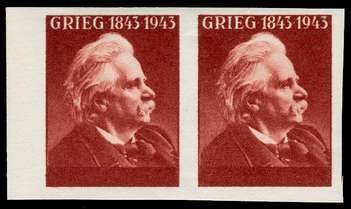 Grieg 1943 Design Test Stamp printed in 1951. PERFORATED single, NH VF. Perforated examples are seldom seen. Need perforated. Please make offer.